As part of the World Shakespeare Festival, Shakespeare’s Globe is devoting the first six-and-a-half weeks of its 2012 season to an almost incomprehensibly ambitious project. Entitled Globe to Globe, it will involve performances of all 37 of Shakespeare’s plays, each staged by a different international company in their own language. I must admit that my first reaction to this was to wonder (a) whether it would attract an audience – King John is a tough sell in English let alone Armenian – and (b) simply whether I’d enjoy seeing these plays, so much of whose appeal lies in the beauty of the writing, in languages I don’t understand. Time will answer (a) soon enough – the hip-hop Othello has already sold out; the Armenian King John has, at the time of writing, not – but any doubts I had about (b) have now been allayed. 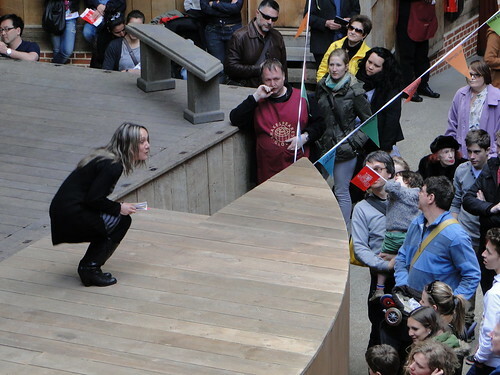 As part of its opening weekend, the Globe put on a free performance called Sonnet Sunday. 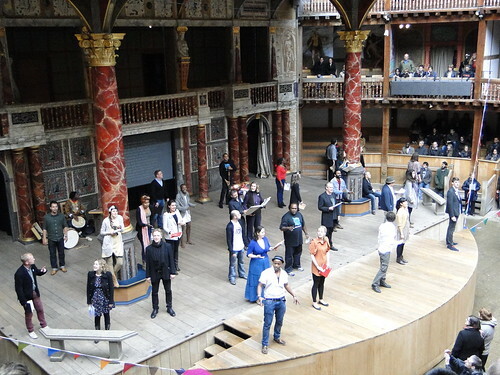 Inspired by the Globe to Globe season this consisted of all 154 of Shakespeare’s sonnets performed by 31 actors in a variety of international languages. It was an epic performance lasting nearly six hours and compered in enormously appealing fashion by actor and Globe Education practitioner Woody Murray, with superb musical accompaniment from Akintayo Akinbode on an amazing array of instruments. The audience came and went throughout the day – we went in after lunch with no particular idea how long we’d stay, but any possibility of our leaving before the end quickly vanished. The English text of each sonnet was projected on to a screen upstage, but I rarely found myself reading it; far from being alienated by not understanding a word that was being spoken I was mesmerised by the actors’ performances, and the sheer variety of styles on display meant there was never any danger of it becoming repetitive. The passion and skill of the performers really did transcend the (many!) language barriers. Among the cast were a few familiar faces from the London theatre scene: Owain Arthur, current star of One Man Two Guvnors in the West End, brought a wonderful warmth to his Welsh-language performances; recent Globe alumnus Gunnar Cauthery gave a series of beautifully spoken and wonderfully lucid readings in Icelandic; and Jake Harders, performing in Latin, was an exuberant delight. Among the other highlights, too numerous to list in full, were Colette Tchantcho’s haunting performances in Kuwaiti Arabic, Miina Maasola’s delightful Finnish, Cristina Catalina’s beautiful acting in a variety of languages including German and Romanian, a frankly bizarre Czech performance involving three actors and a puppet fox, and an enormously charismatic turn from Kyle Morrison, the artistic director of Australia’s Aboriginal theatre company Yirra Yaakin. Not all the languages were foreign as such; there were several performances in historic British languages and dialects. Sarah MacRae, soon to return to the Globe in The Taming of the Shrew, performed in Scots, and Michael Fenner gave a marvellous reading in Cornish. We were also treated to a little background information on these languages and how they’ve contributed to modern day English (the word “hog” is Cornish, apparently), which I found fascinating. Woody Murray compered the whole event with consummate skill, combining an obvious passion for the material with an irresistible charm and a natural ease with the audience that had us eating out of the palm of his hand – not literally, of course, although he did somehow persuade us to chant lines from King Lear (and later “Rain, rain, go away”) while shaking our fists at the sky in a failed attempt to ward off the inevitable downpour, so I imagine we would have eaten out of the palm of his hand had the opportunity arisen! For more photos of Sonnet Sunday from @lorannah, visit http://www.flickr.com/photos/79348191@N02/archives/date-posted/2012/04/22/. Rob is an English student and frequent theatregoer. He blogs about his theatre experiences at http://3rdspearcarrier.blogspot.co.uk/ and tweets @3rdspearcarrier. He lives in Oxford. Sounds unforgettable – but why did it last six hours? How long was each Sonnet? Was there a lot of space between items? Were there lengthy introductions?